Guest host Lignum Draco asks us to experiment with something unusual. Photo by Lignum Draco. All rights reserved. I’m a street photographer based in Sydney, Australia. In my spare time I like to wander around and photograph people. Mostly up close, capturing that fleeting instance of people’s lives that they may not even be aware of. A moment that would otherwise have gone unnoticed. Last year I spent some time travelling around the northwest region of Cambodia, and inevitably this meant visiting the temple city of Angkor Wat. Toward the end of the day, I decided to do the near-vertical ladder climb to the highest level of the central temple complex. 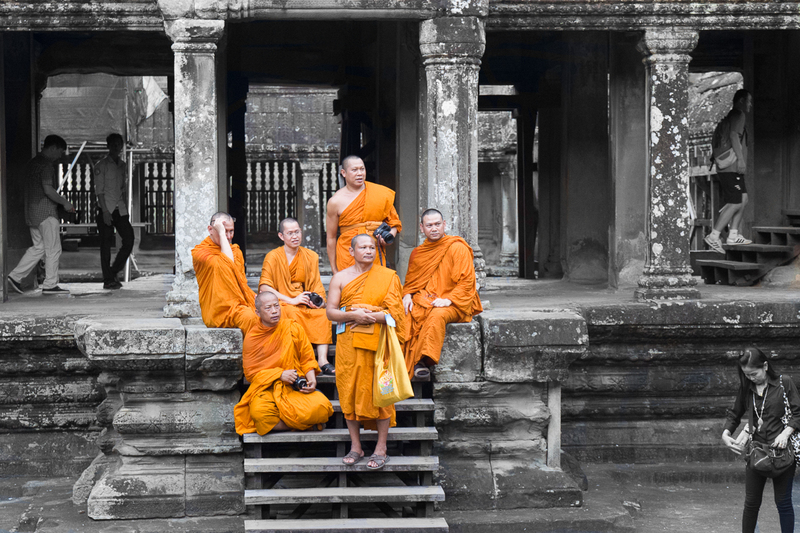 When visiting Cambodia one expects to see temples, tourists, and monks. I didn’t expect an unusual sight: monks being tourists, armed with digital SLR cameras. I had to take a photo before they dispersed. In the fading afternoon light, their orange robes added a certain vibrancy to their surroundings. To highlight this, I chose to process this photo with selective colorization — an unusual technique for me. Nice to see you and your excellent photo, Lignum. Off to find something unusual. Beautiful contrast in the picture! Great photo and your editing skills made the photo ‘pop’ – perfection! I hope you like my contribution to this Challenge! My post this week is unusual in several ways. I’ve never been interested in cars, but lately this has changed a bit. I never shoot cars, but now I did. In addition , this is an unusual car for me. I had never heard about it. I’ve published my post, but initially it had no title. How can I update it in the list? I loved the editing, the photo actually makes me want to do photography. I also think it is curious to see the monks as the tourist in a place people visit to see monks… This is indeed unusual… or maybe I am being steretypical…but I love this pic. Exactly what I thought. I hadn’t expected to see Monks as tourists, especially with modern electronic gear. Thank you. To ask for feedback on your site, please visit the Community Pool — it’s a place you can post a link to your blog and invite others to visit and offer suggestions. This sort of comment here, on the Weekly Photo Challenge, is off-topic and we’ll delete them in future. Awesome capture through the use of colourization technique. I once sketched a drawing for a painting I created called “Hope” in which the background was grey and white (black and white) and the central focus coloured, because I feel that is exactly what spirituality provides the individual; acentral base of hope, of love, of faith in a sometimes bleek world, but, at the same time, a world in which the full spectrum of colours exist. Great post and photo Lignum Draco! Love the juxtaposition of mono and colour in Lignum Draco’s composition. Totally loving the idea of a photo challenge, so decided to give it a go, and this is my take. Simply stunning LD and I love the colour processing in an otherwise B&W image. 556 Responses While this challenge is closed to new entries, we encourage you to visit the Reader to find other avid bloggers. Do What You Wish Tickled pink. Nan's Farm-Inside Out What do you See? Sunrise in Jaipur at Garh Ganesh Temple – Jaipur Thru My Lens !! sonja benskin mesher ..again/i say.. Ouch!! My back hurts!! Friday Flying … the Question? Murtagh's Meadow Don’t you just love potatoes?? The Urge To Wander Not Your Standard Belgian Postcard! Mama's Empty Nest Usual? I think not. |splice.light| photography Tell ’em Ernie! scillagrace Weekly Photo Challenge: What’s Wrong With This Picture? THE PETALUMA SPECTATOR PHOTO BLOG An Unusual Photo Challenge?